The history of South Africa has been a turbulent and often a bloody one, creating a complicated coinage. British forces arrived at the Cape of Good Hope in 1795 and after several spats with the Netherlands, the Cape Colony was formally recognized as a British possession by the 1815 Congress of Vienna. A series of wars with the earlier Dutch Boer settlers and the native peoples, most notably the Zulu, followed. By 1910, Great Britain had absorbed the northern Boer-ruled Transvaal Republic and Orange Free State and the eastern tribal states into the Union of South Africa, a Dominion of the British Empire. This new South Africa became a volatile mix of British and Dutch-descended citizens, immigrants from other parts of the British Empire, and a large majority of native peoples. Instead it used the British pound sterling, together with a multitude of other currencies, to conduct everyday business and trade. This brief historical background is necessary to gain an understanding of South Africa’s rather complicated currency history. 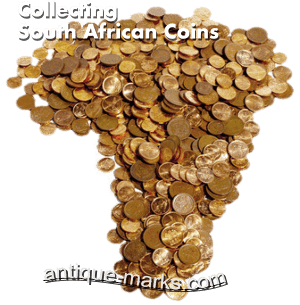 In 1892, the Transvaal Republic (also known as the South African Republic or the ZAR) began minting .925 silver coinage based on the British pre-decimal system. These South African silver coins were minted until 1897 and bear the image of Paul Kruger, the then president of the ZAR. 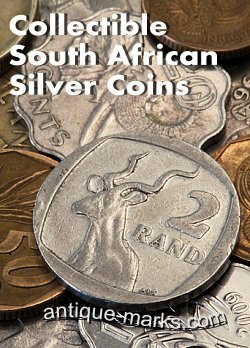 In 1923, the Union of South Africa began minting South African silver pound coins. Like the coins of the ZAR, the silver coins of the Union were identical in denomination to British pre-decimal coinage. From 1923 to 1950, South African silver coins ranged from the threepence to the half-crown and crown, which were designated commonly as ‘two and a half shillings’ and ‘five shillings and were minted of .800 fine silver. Then from 1951 to 1960 they were produced from .500 fine silver. In 1961, the minority white-ruled government declared independence from Britain. They established the Republic of South Africa and replaced the pre-decimal pound with the new decimalised Rand, which is the currency that South Africa uses to this day. The South African government then minted silver Rand coins from two and a half cents up to 50 cents in .500 fine silver, however this run only lasted from 1961 to 1964. From 1965 to 1990, only limited edition 1 Rand coins contained silver, at a fineness of .800. But because of its complicated history and the changes in silver purity and currency format over time, it can be a confusing country for the novice silver coin collector. And old Republic of South Africa Rand coins feature Jan van Riebeeck, an important Dutch South African figure of the 17th century. So, if you’re thinking of pursuing collectible South African silver coins, be sure you are aware of and keep all of these distinctions straight.